It took an 18-year-old local academy graduate making his professional debut as a late injury replacement to spare Manchester United from potential humiliation in the Europa League on Thursday.Many inside Old Trafford will have known little, if anything, about Marcus Rashford when the striker was called up against FC Midtjylland on Thursday after Anthony Martial hurt his right hamstring in the warmup. By the end of United’s 5-1 win, which sealed a 6-3 victory on aggregate and a place in the last 16, the fans were singing the two-goal teenager’s name. Rashford came to the rescue after United fell behind in the 27th minute to the little-known Danish team, which won the first leg 2-1 and was threatening an even bigger shock by pushing into a two-goal aggregate lead. 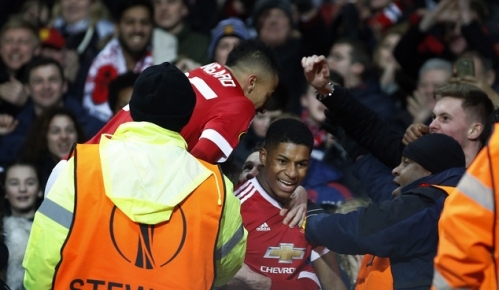 After United equalized via an own goal in the 32nd, Rashford produced clinical finishes after an hour to put the English giants ahead on aggregate and become their youngest ever scorer in European soccer. Ander Herrera and Memphis Depay added late goals, ensuring the final score matched United’s complete dominance. The night, though, belonged to Rashford. “He made a great performance,” said United manager Louis van Gaal, who insisted he had no qualms in starting Rashford despite the size of the game and the youngster’s inexperience. Rashford hadn’t started a game above under-19 level for United. His most recent goal was for United Under-18s in mid-February, which helped lift them off the bottom of their youth league. He started out at the same local junior club — Fletcher Moss — as former United players Danny Welbeck, Wes Brown and Ravel Morrison. “He played an almost perfect game,” FC Midtjylland coach Jess Thorup said. Martial was seen clutching his right hamstring during the warm-up and when United confirmed his absence, Van Gaal was without a 14th player because of injury. Such is United’s injury situation, Van Gaal began with a second-choice goalkeeper, two midfielders as center-backs, a 19-year-old full back making his full debut, and then Rashford — perhaps United’s sixth-choice striker — up front. “It is ridiculous,” Van Gaal said. Still, Midtjylland was there for the taking, with its whole backline seemingly petrified whenever the ball came near them. Much of its defending was last-ditch and Depay was rampant down United’s left, in arguably his best game for the team. Pione Sisto’s goal for Midtjylland came completely against the run of play, the forward holding off Daley Blind, shimmying between Michael Carrick and Herrera, and shooting low into the bottom corner. Nikolay Bodurov turned Depay’s cross into his own net five minutes later and it was suddenly hard to pick between three eventualities — progression for either side or penalties. That was even more the case when Rashford side-footed home from Juan Mata’s pull-back to tie the score on aggregate. But Rashford was on hand to slot in a close-range finish from Guillermo Varela’s cross and complete a remarkable debut. It was left to Herrera, from the penalty spot, and Depay, with a wonderful solo goal, to finish off Midtjylland. Andre Romer was sent off for the visitors with the score at 4-1. Winning the Europa League could represent United’s best chance of reclaiming a place in the Champions League for next season, with the team six points adrift of the top four in the English Premier League.